Time management is actually one of the biggest issues in any individual’s life ,as everyone does not find ample time in order to do their tasks. Though you are a parent at home, work from home or work outside in an organization you will need extra hours in a day to complete your tasks. There is no way to add extra time to the clock, but you can use your skill and squeeze your timing and add more hours to your daily schedule. 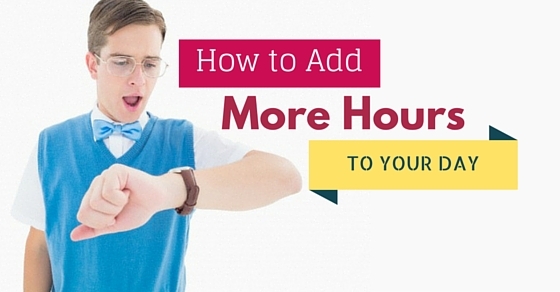 Let’s glimpse about how to add more hours to your day. The author of “No! How one simple word can transform your life” Jana Kemp mentions that handling work just once can help you save nearly 15 to 20 minutes. When you take into account paperwork, emails, or voice mails, it would be fine to read them, answer and delete instantly. By this way, you do not have to go back to the same work again by which time is saved. In order to improve time management skills, the first thing that needs to be started is making an organized work schedule. A lot of time is usually wasted by looking for certain aspects like phone numbers, papers, things and more on your desktop. Hence, make an idea and organize your desktop first and then make a schedule of “to do” list and organize the things that need to be done. Early in the morning when one arrives in office in an enthusiastic way, do not listen to depressing reports. You would get distracted from doing your morning schedule by listening to depressing reports. Ruth Klein who is a lifestyle coach in Los Angeles mentions to watch the positive and motivating news in the morning. • Television: when you think you need more time for the day, then you need to eliminate television. It is never necessary to avoid television completely but the key shows which you enjoy watching and news can be watched. By all other ways, it is really a waste of time. • Internet: The other time-consuming aspect that replaces television is the internet. Schedule timings with work for the internet, which can be difficult initially and later helps you save time. • Games: Many people are addicted to playing games and hence it would be advisable to cut back on playing games to save more time for the day. The author of “find more time” Laura Stack mentions making use of free time. For example, when you get to a bank or a doctor after an appointment, make sure that you would have ample time before you meet them. Hence, it is advisable to carry office papers or documents so that some work can be completed in free time. There are people who work in the morning when they are fresh and can sort out any tough tasks in the morning. In the same manner, people who find tough to work with their tasks can use the time when their child takes a nap or use the time when their children watch television. When work is considered either at home or office it should be carried out in an organized manner. Preparations must be made well in advance, where things are to be kept neat and tidy so that details can be fetched whenever required. Maintaining and organizing avoids overhauls and work is completed before time. When you write your to-do list, most people make it unclear by making use of less inspirational words such as ‘mom’, ‘bank’, and more says the author of ‘getting things done’ David Allen. When you make a plan imagine the desired result in your mind. Make sure to add action verbs in your to-do list such as ‘call’, ‘buy’, and ‘talk to ‘and more. Do not use words that disperse pressure in the chore. Clinical psychologist and Coach Pam Garcy mentions that in order to get things done quickly, multitasking is followed which is actually mentioned as something that is harmful to the brain. To preserve focus, it is essential to tackle the single task at once. In the year 2009, a study was conducted by Stanford in order to measure the ability of multitaskers and non-multitaskers by performing certain tasks. It was found by researchers that with multitasking there was poor memory and concentration. The American Psychological association mentions that lack of concentration can lead to a loss of 40% of productivity. It is important to take breaks along with working hours and is considered important. The Center for Disease Control and Prevention presented about the analysis of 22 studies. The main intention of the study was to show the importance of working overtime which leads to enhanced injury rates, poorer perceived general health, enhanced morality, and more illness. Preparing to do list must be prepared everyday night so that tasks for the next day is organized and ready. Make in mind to complete one task per day, for example, file all papers of Monday, do online banking on Wednesday and more. Make many to do list where one must be done on tomorrow, the next day and so on. Kemp mentions that if every time you are hesitating to take actions, it can slow down your ability to make decisions. For example rather than taking about many hours in hunting for a perfect airfare deal, you can compare the price shop and decide in few minutes. In order to cope up with the stressful work life, it is found that presence of green brings in a natural feeling and also has a positive impact on health. The beneficial factors of painting green are that it lowers the stress hormone called cortisol and also link people with stressful life events. Psychologists Dr. Bill Knaus and author for “The Procrastination Workbook”, mentions that talking a walk outside helps you relax, in the same manner photos of nature along with blue and green above your desk can help you in developing relaxing effects. By this way, you will work more and have a productive time. Chatting on the phone, TV, Facebook and surfing the web are big day wasters when they are not used in the right manner and hence can be avoided. These are advanced technologies used in the present day and eats up more of your time. Hence limiting your time wasters is always a great way to add more hours to your day. The author of “time management from inside outside” Julie Morganstern, mentions that an individual’s calendar should be a source of duty as well as pleasure. It should be one that offers you leisure time for activity so that you’re not loaded with more of work. It is also important to sleep well in order to recharge yourself and work more efficiently the next day. A good sound sleep can offer you good energy and freshness the next day so that you aren’t exhausted and work in a productive manner. It is good to avoid unwanted calls when you’re at work. Make callbacks when you sit with your children in their play time or during their carpool time. It would be good to turn off the email and use them during the morning, lunch and the end of the day as emails are the biggest interruptions these days. The challenge in a task is usually overestimated; it would be a good idea to break down a project into a series of tasks. Garcy mentions that this will usually slow down the process and by which your parasympathetic nervous system would be relaxed. When a project is deconstructed, it will usually help you develop confidence and also small work helps us obtain efficiency and skill required for performing the task. By this way, work is carried out in an efficient manner and more time for the day is obtained. These are a few aspects and tips that can be followed in order to add more hours in a day. When you prioritize work and follow it correctly then you can complete your tasks well ahead of time and find more hours for the day. There are many famed personalities like British Prime Minister Winston Churchill who took a nap everyday afternoon, Facebook COO Sherlyn Sandberg leaves her office every day by 5.30 to enjoy time with her family, do you know how these people found more time to spend with their family and for their happiness? It is because they organized time and worked accordingly so that they obtained more hours in a day. Time management and organization of work is something that must be planned and carried out.